Jen began her ministry at Christ Church in March 2018 and is thrilled by the opportunity to serve the precious children of the parish. Throughout the years, Jen has served the church in a multitude of ways, including lay reader, Parish and Contemporary Choir member, VBS leader, Children’s Choir assistant, Music Librarian, and administrative helper. Jen has a BA in English Journalism from the University of Delaware, and a MSc in English Literature from the University of Edinburgh, Scotland. 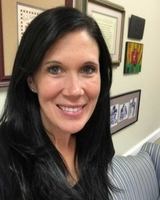 Upon completing her degrees, Jen entered the field of education and acquired experience teaching at every grade level, K-12 and Special Education, before finally settling on high school English. Jen and her husband, Dave, have a 6th grader, Doug, a 5th grader, Sally, and a five-month-old baby, Katie. Jen has a passion for working with children, the bible as a literary text, church liturgy, and theology, and is excited for the opportunity to combine these passions into one glorious ministry.